Vehicle Graphics are the mainstay of many business advertising programs. Make sure your vehicle is working for you all the time with graphics that help you GET NOTICED! Cargo van graphics can cover as much of your van as you want including full coverage called a COMPLETE WRAP, or partial coverage - we will work to make your van graphics match your advertising needs and your budget. 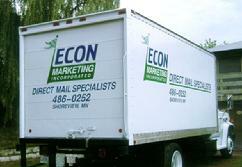 A box truck or cube van is a natural rolling billboard for any business. Graphics can be applied directly to the surface or mounted into a frame for easy change-out of your advertising message. Don't underestimate the selling power of CAR graphics. They may be smaller but can have just as much impact if done well. The example above has REFLECTIVE copy and really shouts out at night.